Our whole 2nd grade decided to participate in a Halloween Fun Friday where the kids would rotate to each classroom for a different station! Our classroom had to do a craft that could easily be done with 25 2nd graders in 15 minutes and could be done affordably with a total of 150 students - no easy task! 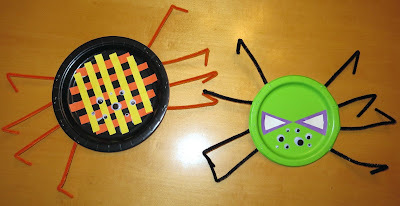 We ended up making paper plate spiders. This craft fit the qualifications and was super cute - perfect! We asked each child to get 1 plate, 2 pieces of construction paper, & 8 pipe cleaners and then sit at a desk. At each desk, we had scissors, glue, & a small cup with 8 googly eyes of different sizes. (did you know spiders have 8 eyes??) The kids cut their construction paper into whatever shape they wanted and glued it to the plate. Then they glued the eyes to the plate. Adults were coming around and stapling the pipe cleaner legs to the plate. Here's the finished product! Love these!